It was reported a while back that a school in Canada had banned soccer balls, footballs, volleyballs, basketballs, and the like from the playground for safety reasons. As you can imagine, all I could say at the time was grrrrrrrr. But here's the good news. I wasn't alone in my outrage and after many complaints the ban was lifted and childhood restored on that playground, at least for the time being. The objective of pretty much every ball game is to MOVE the ball which, in turn, makes it high energy play. How, where and when you move and control the ball is up to you in accordance to the rules of the game you choose, but by and large, Ball Play involves one or more gross-motor, whole-body skills including: throwing, rolling, kicking, bouncing, and batting. 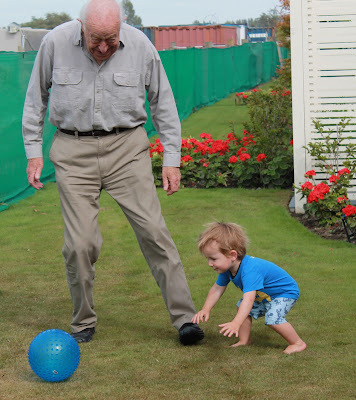 To adults, these seem simple enough, but in order to do any of these ordinary activities, sophisticated sensory and motor skills are at work including Proprioception (a sense of your own body), Spatial Awareness (a sense of the space you occupy), Temporal Awareness (timing), Directionality, Balance, Eye/Hand and Eye/Foot Coordination, among others. But physical activity and the fitness that results is only the beginning of the benefits of ball play. 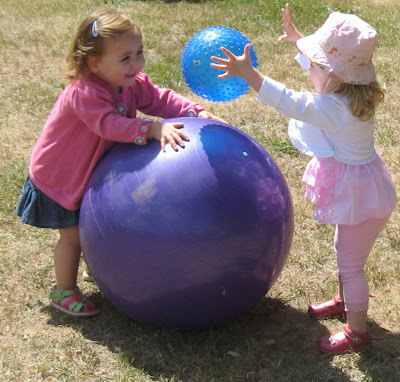 The natural, unplugged, kinetic energy of a rolling, bouncing, spinning, soaring, red rubber ball is a universal metaphor for child’s play. And for good reason. If you think about it, the red rubber ball plays exactly the same way a young child does... tirelessly rolling from one thing to another with nothing more than a simple nudge in any direction. And with that nudge, just like little ones, the simple-yet-enigmatic red rubber ball reacts in endlessly unpredictable ways. Which way will it roll this time? How far and fast will it go? How high will it bounce? And where will it go after that? Take, for instance, catching a ball. Your child must anticipate or predict the direction and speed of the ball as it’s coming at her. Then, she has to figure out how to get herself in position to meet and catch the ball. Every part of her body is involved in the effort, and whether she catches it or not, her brain has tracked and recorded the nature and physics of that experience in order to apply it the next time. Only, here’s the thing with Ball Play. Chances are the ball will react a little or a lot differently the next time! As such, Ball Play keeps little ones on their toes, expecting the unexpected, teaching their brains and their bodies to react to changing circumstances. 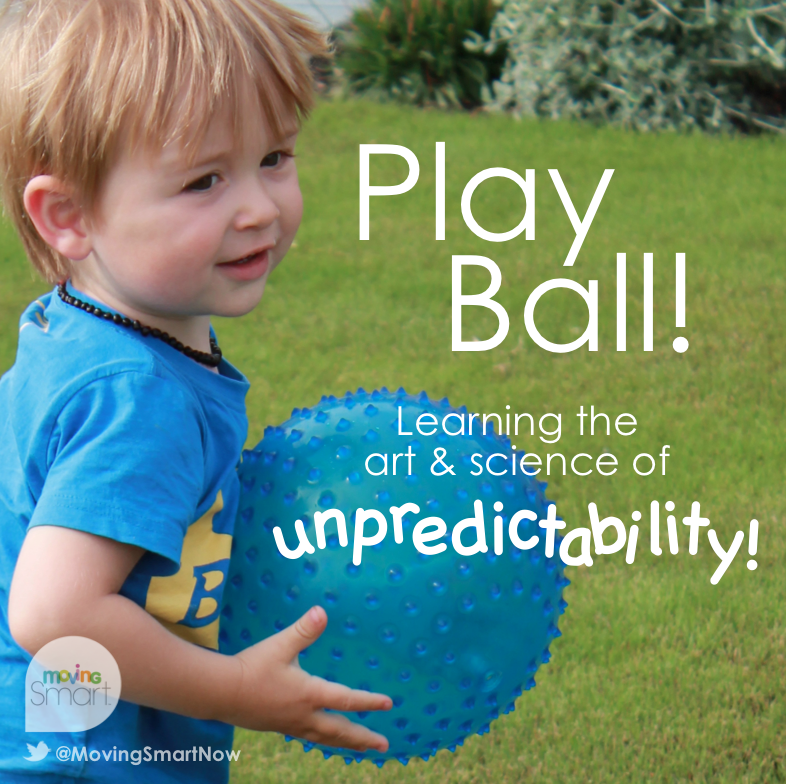 In other words, Ball Play is an early lesson in the art and science of unpredictability and learning to control situations and ourselves in the process. When playing with two or more players, the object of the game usually has something to do with passing the ball back and forth. 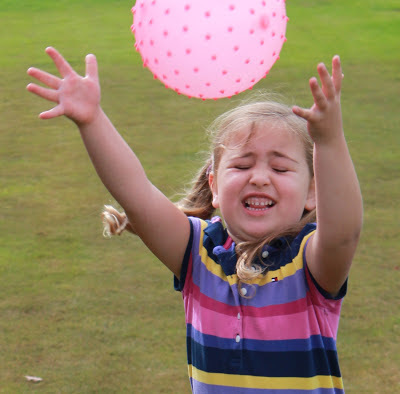 That means from the outset, children are learning to let go and trust that somehow the ball will make its way back to them. As such, ball play is one of the first, physical realizations of the broader concept of sharing, and may explain why we all feel an immediate and lasting disdain for ball hogs. By it’s very unstructured nature, a ball can become anything in the hands of the players. Whether it's a conventional game of soccer or basketball, or one the players make up on the spot, the simple, red rubber ball may well be one of the world's most perfect toys – a cooperative playmate for any game the players wants to play. And finally, yes, I agree in a playground filled with children and balls flying through the air that there is a chance an out of control throw or kick may hit the wrong target. Yet I would argue that if your child is never in a situation where the unexpected happens, how will she ever learn to duck? Ducking is an essential life skill... self-protection at its most rudimentary level. After all, avoiding trouble often begins with the ability to see it coming. 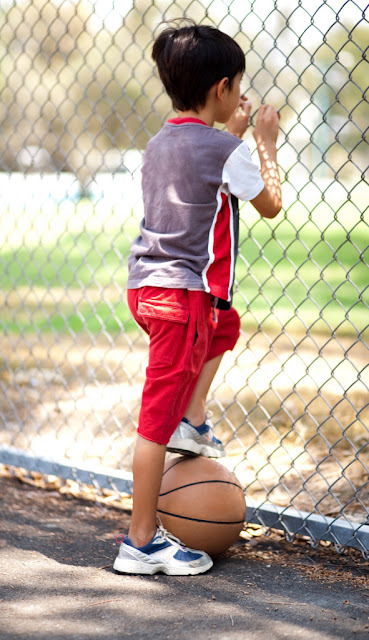 Now, no one wants to see anyone get hurt, but in light of the physical, cognitive, emotional, and social benefits of Ball Play, in my opinion, banning ball play on the playground is not only a visceral outrage, it is an educational affront, and a bad bounce for today's kids. wow, banning ball play is one of the silliest things I've heard!! Couldn't agree with you more, Michelle! I can't imagine life without playing ball (even though I am still a terrible catch! I was sad when swings were considered "dangerous" but balls? seriously? I've been clobbered a few times by balls - but survived! Gill you have turned your GRRRR.... into something very positive and extremely valuable!! My grrr is that we have to continue to defend and promote the benefits of play! Some days I get to the point of asking... "Why is it that there is so much information available and so many individuals, groups organizations and business explaining the very real difference play makes and it still is not widely known?" "Play is too simple.. there must be something more complicated. It is 2011 after all... children shouldn't be playing with a ball." Thank you as always for your part in creating this needed awareness ..... and clearly explaining how there is a wealth of learning that occurs through playing with a ball! It wasn't even a kid who was hurt. A parent apparently suffered a concussion after being hit in the head with a soccer ball. That must have been one hell of a kick and one hell of a hard ball....see what happens when you don't learn to duck! Ball play is often used with non verbal children to teach them conversational skills. First you go, then I go. Children who have trouble speaking and socializing sometimes will not bother to catch the ball, or, once caught, will not throw it back. When they can understand the give and take of catch, they can understand the give and take of communication.